Soccer: After a historic season, Coach Tom Giovatto and Junior forward Kevin Correa are rewarded for their efforts. St. Francis Brooklyn men’s soccer team achieved it’s most successful season in over three decades in 2013. Early this week BigAppleSoccer.com named coach Tom Giovatto Coach of the Year and Junior forward Kevin Correa Player of the Year. In December of 2013 the National Soccer Coaches Association of America named coach Giovatto the North Atlantic Region head coach of the year, and Correa earned NSCAA All-America first team honors. This past season, head coach Giovatto led the St. Francis Terriers to the NEC championship where they won for the first time since 1998. With winning the NEC championship, it earned them a berth into the NCAA Division I soccer tournament for the first time since 1982. Junior forward Correa had an outstanding season for the Terriers with 13 goals and 6 assists. Correa was a great contribution to the Terriers’ success. 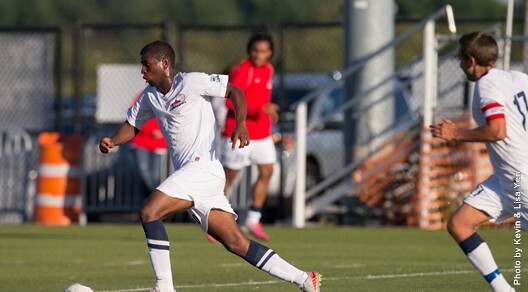 Correa scored four goals in the NEC Tournament; two were free kicks in the championship match against Bryant. The Flushing, N.Y. native was named Tournament MVP and made the all-tournament team. St. Francis earned the conference’s automatic bid, after becoming the first fourth see to win the championship since 2007. The Terriers would go on to lose to the Penn State Nittany Lions in the first round of the NCAA tournament. The Terriers recorded their highest win total (12) under their seventh-year head coach Giovatto. This fall Correa will get a chance to defend his title as Player of the Year in which BigAppleSoccer.com crowned him as.